The oldest premium cigar factory in the Dominican Republic is continuing its tradition of releasing limited-edition cigars blended with aged, harvest-specific tobaccos. 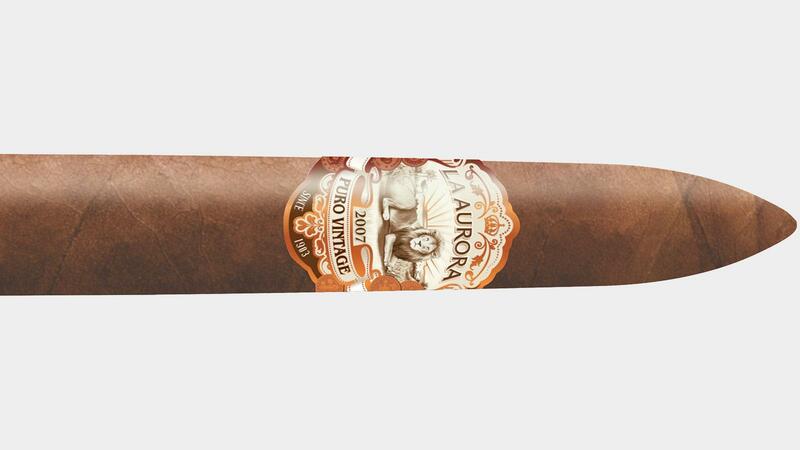 Next week, at the IPCPR trade show in Las Vegas, La Aurora will debut Puro Vintage 2007, a salomón-shaped cigar blended with 11-year-old tobacco. Puro Vintage 2007 wears a Dominican wrapper, Ecuadoran binder and filler tobacco from the Dominican Republic, Brazil and Nicaragua. According to La Aurora, all of the tobaccos in this blend come from 2007 harvests. The cigar comes in one size only, a salomón measuring 6 1/2 inches by 50 ring gauge, which will retail for $22. Only 6,000 boxes of 10 will be released. The Puro Vintage series has been a staple in La Aurora’s limited-edition portfolio since 2009, when the company released the 2003 Salomón. The original release was followed by Puro Vintage 2004 in 2011, Puro Vintage 2005 in 2013, and Puro Vintage 2006 as part of La Aurora’s 111-year anniversary celebration in 2015. Puro Vintage 2007 will mark the fifth release in this series. La Aurora cigars are rolled at the La Aurora S.A. factory in the Dominican Republic and are distributed by Miami Cigar & Co.